The final score, 28-21, won't show it, but the Jets dominated the Patriots in their shocking, undeniable thrilling division round win tonight  as thoroughly, in their own way, as the Patriots dominated the Jets on "Monday Night Football" a few weeks ago. The Jets did everything better than the Patriots tonight, in a display that was as impressive as anything the team has done since Rex Ryan came here, perhaps as anything the Jets have done since Super Bowl III. The Patriots came into this game having scored, in the last eight weeks, 39, 31, 45, 45, 36, 31, 34 and 38 points. And the Jets made them look lost and bewildered, from Tom Brady to Wes Welker to, most of all, Bill Belichick. Rex Ryan talked all week about this being the second-biggest game in Jets history, and he had that odd mix of arrogance and desperation that comes to those who believe their entire professional lives ride on one particular game. He went all in. And doggoned if he didn't pull it off. The defensive performance by the Jets was heroic throughout (Bill Barnwell from Football Outsiders, who has been skeptical of the Jets all year, called it "one of the best games any team's played this decade"), particularly in the second and third quarters, but it was a play late in the fourth quarter that stood out. With the Patriots down 21-11 with five-and-a-half minutes left, on a 3rd-and-14, Tom Brady stepped back and looked for a receiver. Any receiver. All week, all we heard  OK, not all we heard  was how the Patriots and Bill Belichick's super-genius formations would be exploiting mismatches all game, that Darrelle Revis would be rendered irrelevant. And there was Brady, with all the time in the world, finding no one, for about an hour. (On a side note, an hour was also how long that Patriots drive looked; they took up half the quarter moving down the field even though they were two scores down. It was downright Les Miles-esque and far from Belichick's best moment.) He threw an incomplete pass, and then Brady couldn't connect to Deion Branch, and the game was essentially over. As Mark Sanchez knelt down to run off the final seconds, Braylon Edwards, who like fellow wide receiver Santonio Holmes has reinvented his career with the Jets, leaped off the field with a series of backflips. Every Jets fan felt the same way. 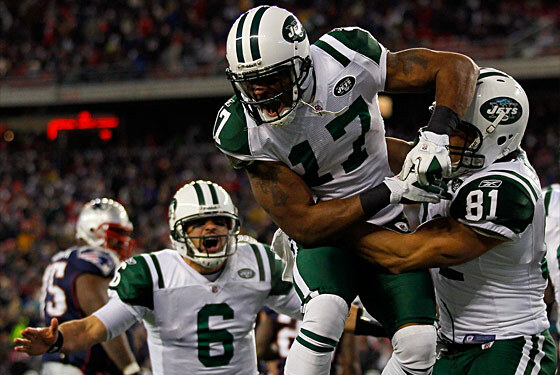 It was the type of game you couldn't believe was happening throughout, whether you were a Jets fan or a Patriots fan. It justifies all the ridiculousness of this season, all the drama, all the comedy, all the messiness, all the embarrassment. It was, hog-tied together in one bulging, overstuffed, sloppy package, the quintessential Rex Ryan game. As Lt. Aldo Raine put it, "this is the one they'll remember me for." Of course, oh yeah, the Jets still have another game to go, a game that, ahem, will decide who goes to the Super Bowl. If the Jets can win, Mark Sanchez will have beaten the quarterbacks who have represented the AFC in the last seven years in three consecutive weeks. It will have been an achievement unparalleled in Jets history, or even NFL history. But that can wait. We'll have a week to deal with that. Tonight, it's a night for celebration. The Jets just stuffed the Patriots, in every possible way. It's a night for backflips.